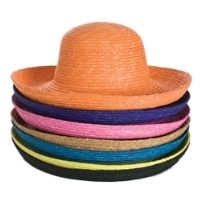 Add a splash of color to your day with a wide-brimmed straw hat. These hats are perfect to protect your skin from the sun while styin' at the pool club, beach side or on the patio for brunch. Choose from tan, pink, purple, blue, black, yellow, orange, light green.